The School of Photography was founded at the former Rochester Athenaeum and Mechanics Institute (RAMI) in 1930 at the request of industrial photographic interests in the Rochester area. Such organizations included Bausch and Lomb Optical Company, Defender Photo Supply Company (now the E.I. DuPont De Nemours Company), Haloid Company (now the Xerox Corporation), and Eastman Kodak Company. The educational objective was to provide trained employees for these organizations as RAMI was already providing training in electrical, mechanical and other fields. The coordination of events leading to the formation of the School of Photography issued from Eastman Kodak Company's Director of Training and Personnel, Mr. Earl Billings. Mr. Frederick F. Brehm was reassigned from his duties at the Eastman Kodak Company to be a part-time teacher in what was to become the School of Photography. This remarkable inventor and craftsman brought his creative ingenuity to the students enrolled in the first year of a two year cooperative or work-study photography program. The first class in September 1930, consisted of 24 students. C.B. Neblette was "loaned" from Eastman Kodak on a part-time basis to the school in August of 1931. He joined Mr. Brehm and became the teacher of the second year class. Messrs. Brehm and Neblette together comprised the entire faculty of the Photography Technology Program. They were considered part-time faculty as they taught two half-days per week. Students were also enrolled in classes from other divisions. Mark Ellingson, now President Emeritus, was the school's first supervisor. His duties in 1930 were divided between supervising the school and working on curriculum planning and development for RAMI. Ellingson continued as supervisor until 1939 when C.B. Neblette was named supervisor and Ellingson became president of the Institute. C.B. Neblette became the first full-time faculty member in August of 1936, although he was still considered "on loan" from his employer, Eastman Kodak Company. Mr. Charles Savage joined Neblette and Brehm in 1937, and Mr. Wallis Dobbs was added to the faculty soon after. The addition of Savage and Dobbs emphasized professional photography as well as photographic technology. Dobbs was from a studio in Michigan, and Savage, a RAMI graduate, class of '32, had operated his own professional portrait studio in Warren, Pa. The addition of Dobbs and Savage resulted from the trend which developed from the first class’ growing interest in the professional rather than technical aspects of photography. Many students came from Ohio and Pennsylvania, and wished to return to positions in their home areas. 1936 brought a change in the two-year cooperative photography program. About 30-40 first year students were entering the program. The net result was that the Rochester photographic industry had problems in absorbing the graduates. It was also evident that many students did not wish to be involved in the cooperative "learn and earn" aspects of the program and some did not want to go into the industrial aspects of their field. The industry did not want to be involved in training first-year students as technologists. So, to meet these problems the two-year cooperative photography program was changed to a three-year program. The first year was a tull-time school year, and the remaining two years were taught as a cooperative program. However, a student could elect full-time status eliminating the cooperative, if he chose. Two distinct programs were operated under the three-year system. Photographic Technology retained the technologists' training, and Professional Photography prepared students for the studio and advertising photography aspect via four majors: General Professional Photography, Portrait Photography, Commercial Illustration Photography, and Color Photography. Color advertising photography became a part of the curriculum when P.H. Shawcross joined the fauelty in 1947. Shawcross retired in 1953 and Robert Bagby taught color advertising photography until 1968. The names and service dates of the school's faculty are presented in Appendix I. As the number of first-year students increased through the years, it was evident that Neblette, now Director, had made the right program decisions, as the Professional Photography courses were well accepted. Howard Colton and Silas Thronson joined the faculty in 1939, and brought educational expertise in color photography and photographic chemistry respectively. Both of these gentlemen undertook as their first project research with students into the formulation of dyes for the wash off relief color print process. The project was successful and resulted in a remarkable saving for the operating budget as commercial dyes were quite expensive and the volume used was rather high. The faculty consisting of the above mentioned members was stable through the early WWII years, when the students consisted of about twelve civilians, mostly women, and members of the U.S. Army Signal Corps. Incidentally, the troops were housed in an East Avenue hotel and created quite a patriotic stir as they marched to and from the Institute on Main Street. Thronson introduced an aerial photographic mapping course in 1941, the beginning of the instrumentation aspect of the present school. Much of the stereo viewing and plotting equipment was fabricated by the students under the direction of Thronson. In the early years of the war, Howard Colton was employed by Eastman Kodak, and remained with that organization until his retirement, when he returned to RIT as a part-time teacher. One of the highlights of the early school years was the induction of the first year students into the Mysterious Order of Corn Borer's Society (MOOCBS). The initiation was really an opportunity for all to get acquainted. Baseball, tug-of-war and especially the hot dog and corn roast were preceded by the arrival of a twelve-foot long huge corn barer made of chicken wire and crepe paper and sporting two huge antennae with "Press 40" flash bulbs attached. The creature was carried aloft by upper class students. The script was read, and the first-year students prostrated themselves before the creature. After promising not to develop film in hypo, a promise they repeated several times to show their sincerity, the flash bulbs would be triggered and the initiates would arise as new and important members of the ancient and noble MOOCBS. The corn roaster along with the ceremony was a product of the delightful imagination of Fred Brehm. The corn roaster consisted of a charcoal-burning bin with a one bag capacity. Above the bin was a ratchet system and metal fingers which would advance the corn 3 inches and rotate the corn one-third of a revolution. I can still see him working the ratchet advance mechanism by moving a lever (the emergency brake lever from a Model T) while we would take turns at stripping the corn and wielding a paint brush soaked in melted butter. Genesee Valley Park no longer rings with freshman voices vowing not to develop film in hypo, as the MOOCBS faded with the advent of World War II. Charles Savage and a few of the remembering faculty resurrected MOOCBS in the early fifties but interest was on the wane. Perhaps no one develops film in hypo in these days of accelerated learning ... or would admit to it! The two rooms which constitute the School of Photographic Technology in 1930 were located in the northwest corner of the Eastman Building. This building was on the corner of Plymouth Avenue and Broad Street in downtown Rochester. Conversations with C.B. Neblette indicate that he and Brehm would "borrow" a densitometer and several other pieces of equipment from Kodak for class use. The equipment had to be turned in at the end of each day. Unfortunately the Eastman Building was wired for direct as well as alternating current and the wall receptacles did not indicate the differences. Before the outlets could be labeled, a student plugged the A.C. densitometer in the-D.C. outlet. C.B. said that it was indeed an expensive "experiment," requiring some explaining when the equipment was returned to the company that evening. The two rooms caused other problems, too. When a photograph was to be made, others in the room had to turn their lights out and one would wait until vibrating machinery in the building stopped enough to allow an extended exposure. In 1931 the school moved studio operations to the second floor to the left of the main stairway. This move allowed the students to photograph in the new area and then go downstairs to the far corner of the building to develop their negatives! Equipment was meager and had to be shared by the students. It was obvious by this time that the RAMI budget would have to be supplemented by equipment and other support supplied and sustained by the photographic industry as a whole. Such support now is truly international in scope. The "Co-operative Photographic Technology Program" received quite a windfall of space when the facilities in the Eastman Building were exchanged for much of the second and third floors of the Annex Building. This was between the west side of the Eastman Building and the east side of the RAMI heating plant. In addition, a beautiful house on Washington Street, known as the "Practice House" of the Home Economics Department, was pre-empted and converted into a studio and printing facility. The living and dining rooms of the house provided classrooms and "large" studios, and the bedrooms were converted into smaller studios. The students were pleased that the previous designers and builders had included four bathrooms, which were converted into fine darkrooms. The basement was utilized for the wash off relief color printing process. If memory serves, a "trap line" was also operated by the more enterprising students to keep the rodent population under control. The Annex second floor had 25 negative loading/processing darkrooms, a chemical-mix area, a large printing room with about 26 printing stations and a very long darkroom sink in the center. The windows were painted black. One might be waiting for a lengthy enlarger exposure to terminate only to be fascinated by the movement of upside-down people and autos on the wall as they moved on Washington Street. A chink in the paint on the window gave a camera obscura effect. Chemicals continued to be supplied by the school and students supplied sensitized materials. Students mixed their own chemicals, and the-containers were stored in a common storage area. It was soon apparent that the bottles could not be properly labeled, since they would be “borrowed" by fellow students. As a result, a remarkable collection of labels appeared. Some had number codes a la antique shop labels. Some had girl friends' initials, and some were impotent "decoy" solutions. The situation regarding chemical storage was sufficiently confusing that students were induced not to pilfer from each other. The studios were on the third floor in one large loft. Moveable "flats" allowed easy expansion or contraction of studio space as required for a student's project. Cooperation of the students was necessary so that one person's lighting did not interfere with another's. Physical education exercise courses were not required! It was felt that a day's activity of running to the studio floor from a darkroom, with a loaded holder, and then back to the second floor for processing was sufficient activity. It was remarkable that no serious accidents occurred, when one considers young people taking two or three stairs at a time in their pursuit of education. The move to the Annex and equipment additions also allowed more specialized activities in the program, as evidenced in the 1938 RAMI catalog: the addition of a special processing laboratory... new professional lighting equipment and a retouching room designed by C.B. Neblette and Miss Bonnie Wein. The school was growing! The Rochester Athenaeum and Mechanics Institute's name aptly reflected the heritage and direction since its beginning in 1829. However, with the distinct change in technical involvement, it was felt that RAMI did not indicate such direction. Accordingly, in 1944, RAMI became RIT, Rochester Institute of Technology. By 1946 the "Practice House" and the Boiler Building were demolished and the Clark Building was built on the corner of Broad and Washington Streets. The entire third floor of the Clark Building became the new home of the Photographic Technology Department. C.B. Neblette allowed the faculty a remarkably free hand in the design of the Clark photographic facility. As with the present Henrietta photo facility, the faculty kept the better concepts which had evolved in the past and attempted to them where they could. For example, the Clark operation retained the "loft" idea of the Annex studios. However, each studio area had a secure bay in which lights, stands, tripods, a 4 x 5 view camera and allied equipment were stored. This allowed a student more efficient use of his time, rather than waiting at a cage for equipment check-out. There were two studios: first-year and upper class. The main difference between them was that the first-year studio's ceiling was about 10 feet tall; the upper class studio's nearly 30 feet high. When bounce lighting became more utilized, the lower ceilings were in greater demand. Between the two studios, some 50 students could be accommodated. A bank of 25 darkrooms was assigned to color. There were double occupancy darkrooms for first year printing, and 25 single student darkrooms for upper-class printing. Negative darkrooms were smaller, but could be used by about 50 students. Dye transfer rocker tables were designed by instructors of color photography. These tables are still in operation at the present Henrietta location. Silas Thronson developed a then "new color sheet film processor, with vane agitation." Specialized rooms included an equipment and chemical cage, retouching room, and apparatus room. By 1956 alterations produced an optics facility, photographic chemistry laboratory, and print critique rooms. Faculty office space was limited to three rooms; two of these rooms had the majority of the faculty members. This was excellent insofar as communications and comradery were better than smaller offices could afford. Solutions were prepared at first by a cage attendant and later by a student assistant. Containers of processing solutions were distributed to processing darkrooms. The laboratories were served by a 68 degree F. temperature control system. Fortunately, the present location is water temperature controlled in smaller areas so that elevated and changing processing temperatures can be maintained. Enrollment increased from about 50 a year, before Clark, to some 400 a year before the move to the present site! The Clark photographic facility was a remarkable commitment by the Trustees, RIT officials and Rochester industry. This was only the beginning! In 1959, President Mark Ellingson brought students, faculty and staff together for a review of the real estate problem. The state and county were making plans for a highway and clover-leaf system, which would remove much of the Third Ward RIT property holdings. The problem was either to build a vertical Institute on what we had left, or we move. The final answer: move. Photography by now had 400 students and three programs, Professional Photography, Photographic Illustration, and Photographic Science and Instrumentation (changed from Photographic Technology). The School's name was changed to School of Photography in 1960. In 1962, C.B. Neblette was named Dean of the College of Graphic Arts and Photography, as well as Director of the School of Photography. The rules of designing the new RIT Henrietta campus were to plan on twice the number of students, to plan on same programs then being taught. The early '60s were busy years for Neblette and his faculty, which now numbered about 20. Each faculty group as well as individual members was responsible for plans for the new campus. While the architects and facility designers produced the final drawings, the faculty were basically responsible for the new building's layout and specialty areas. Indeed, many areas took on faculty names such as Bob Ohl's industrial darkrooms, Shoe's chem lab, Stroebel's studios, etc. All appeared to be going well until new programs were started which had not been taught in 1960, the date when the "rules" were set. For example, the BFA program, born among strong opinions under the Minor White-Ralph Hattersly regime, was now growing. Space was needed for expansion of the motion picture course; space was needed for additional faculty offices and for photo finishing facilities. 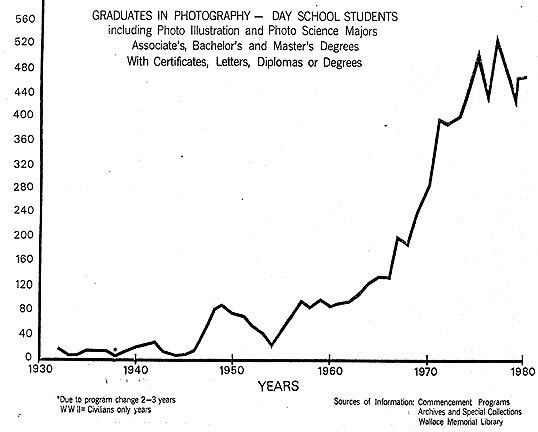 MFA Photography, MS Photographic Science and Instrumentation Division, Biomedical Photographic Communications, and Television courses were not even considered in the early '60s. Ground was broken and the new campus in the Town of Henrietta was underway in 1961. However, the building was not available for occupancy until 1968. In the meantime Dean Neblette relinquished the reins of the School of Photography's Directorship in 1966, and William Soule Shoemaker was made the new Director, with the approval of the faculty and RIT's administration. Professor David Engdahl was appointed Assistant Director. D.B. Neblette remained as dean of the College of Graphic Arts and Photography. A strong feeling existed that the name "School of Photography" did not adequately describe either the educational philosophy or objectives. Accordingly, faculty members elected to change the school's name once more, to the School of Photographic Arts and Sciences. From the beginning years, administration, students and faculty have enjoyed a remarkable ability to work together for the common good of the school. Much to the consternation of some, C.B. Neblette instituted a policy to involve students in the formulation of school policies. The students were given the opportunity to elect a representative to attend faculty meetings, express opinions and give advice from the student view. Wherever possible, the administration has cooperated with student projects. In 1936 the "Photo Tech Bulletin," a student paper, appeared. It consisted of articles written by students, reviews, evaluations of technical publications and hints on practical photography. During the early forties, it was sent' to all alumni, especially those in the service. It was noted that in 1940, want ads and notices appeared in the "Bulletin." One wonders how successful the following want ad was: "Wanted -- An unsteady woman -- one who is not going steady. C. L. K."! The Photo Tech Bulletin faded from existence, unfortunately, in the post World War II years. Another publication entitled "The Photo Scientist" was produced by photo science students and was a remarkable publication in that 'it was of sufficient caliber to be requested by libraries and persons not normally associated with RIT. It was published from 1970 until 1975. The D.L.E. Honorary Photographic Fraternity was formed in the early fifties. Its members assisted in tutoring students and became an important asset to the school. The organization lasted until after the move to the present campus. Other student-produced publications include the current "Geneseean," which is published by the photographic journalism students. Students and faculty were often told before we moved to the Henrietta campus that we would leave some problems behind but we would have new problems, not even thought of at the old campus. The School of Photographic Arts and Science was in session through the summer of 1968 and started to move to the new campus two weeks before the beginning of the Fall Quarter. We moved in and pushed the workmen out. Late deliveries of equipment brought unhappy students to the sundial at the housing complex. Fortunately, upper class persons took control, suggesting all students work to help the move instead of complaining. It worked! The Winter Quarter was punctuated with a problem of "who shall evaluate or censor student or faculty photographs for exhibit." Again, cool heads prevailed and a sensible understanding was reached. The Spring Quarter found faculty and students from several colleges as well as off-campus persons embroiled in a court case involving a charge that the publication of several photographs was not in the best patriotic taste. The case was dismissed. Through all of these first year activities the faculty, students and administration held together and came through the experiences stronger than before. Such experiences which punctuated the first year have not recurred. On this 50th Anniversary of our school, it is not boasting to note that RIT's School of Photographic Arts and Science is composed of a remarkable cadre of educators who are constantly striving for better educational methods and who are working in an outstanding facility made possible by far-seeing Trustees and Administration and cooperatively equipped by an understanding industry. The Archives Office at RIT contains a collection of official catalogs which make curriculum development studies possible. Although it is not the scope of this history to detail such development, a brief review of one area, fundamental concepts in the first year, may be of interest. All students were required to enroll in a cluster of three courses: Fundamentals of Photography, Photographic Physics and Photographic Chemistry. When the Photographic Illustration Program began, those students were not required to take the photographic physics or chemistry course. Indeed, by the time the move was made to the new campus there were two different first year courses: one course for those entering Professional Photography and one for those entering Photographic Illustration. The Photographic Science first-year students took neither course but were involved with chemistry, physics and calculus. In the early seventies, a concept of a "common first year" was developed for the Professional and Illustrative students. Regardless of which field they would enter, students would enroll in "Materials and Processes of Photography." Essentially this provided a return to the teaching of the basic technologies of photographic chemistry and photographic physics. "Materials and Processes" is a remarkable contraction of three one-year courses into a one year course. It was accomplished by the preparation of a self-learning manual. The combined lectures, review sessions and workshop laboratories made for a successful formulation. Even this concept is reviewed annually. Appendix III lists the various photographic programs and when they came into existence. Faculty consulting with government departments and industry, never a deterrent to teaching, on the contrary has been very beneficial to the programs. Of note is the M.S. Program in Photographic Science and Instrumentation, which was introduced through consulting contacts. The United States Air Force urged that such a program be developed to meet the service needs for educating officers in the photographic science field. Civilians and military personnel now attend the program. Educating service personnel was not new to the school with the 1963 M.S. Program. "United States Navy Quality Control of Photographic Processing" has been taught each summer since 1958, and members of the Canadian and United States Armed Forces have enrolled in existing school programs during and since World War II. Professors Rickmers, Todd and Shoemaker formed a consulting partnership, "RST Associates." Contacts made through such consulting brought equipment and course-updating concepts to the school. RST Associates was formed in the early sixties and was terminated when Professor Hollis Todd retired in 1976 after 29 years of outstanding teaching at RIT. Photographic education involves many disciplines. It may surprise the uninitiated to learn'that statistics is considered an important aspect of some courses. Indeed, it was fortunate that Professor Albert Rickmers joined the faculty and saw this need. He has taught various aspects of the subject for years. His outstanding teaching techniques have brought much positive attention to the School and have enhanced our graduates' abilities in their chosen career fields. To supplement faculty teaching, it has been deemed desirable to invite qualified guest speakers from specialized fields to speak. A partial list of these speakers who have come to our School is presented in Appendix II. Dean C.B. Neblette retired from RIT in 1968. His long time associate and close friend, CharlesSavage, retired in 1966. Dean Neblette and Assistant Director Savage helped the school to grow progressively since they had first joined Fred Brehm. In the early '30s many consider Neblette, if not the first, then one of the first truly great photographic educators in this country. There was mutual respect and trust between C.B. and "his" faculty. He guided with a light hand. About one-half of the Clark Building's photographic equipment could not be moved to the new campus. Some was rapidly becoming obsolete, and the new campus required more than twice the amount of equipment used at the old campus. Such factors resulted in the solicitation of help from a broad segment of the photographic industry. Accordingly, director William Shoemaker and associate director David Engdahl embarked on operation "New Equipment." The faculty joined in, making a team approach. When the industry saw what RIT was willing to commit to its field, help came in from small and large organizations, Present equipment is valued at more than four million dollars. A few vital statistics may be of interest: There are approximately 1000 students in the School of Photographic Arts and Sciences, which is housed in the Frank E. Gannett Memorial Building on the main campus. The School contains 60 studios, 200 darkrooms and 30 specialty areas, including a Photographic Chemistry Laboratory, Sensitometry Complex, Technical Studio, Densitometer and Computer Terminal Area, Optics Lab, Industrial Lab, Bio-medical Lab, Processing Facility, Chemical Mix Area, Film and TV Center, Retouching Studio, Color Complex, "Cage areas," and the C.B. Neblette Reading Area. Quite a change from the corner classroom-studio in the Eastman Building of 1930! In 1969, Dr. Lothar Engelmann was appointed Dean of the College of Graphic Arts and Photography, composed of the School.of Photographic Arts & Sciences, The School of Printing, and the Technical and Education Center of the Graphic Arts. In 1977, Professor William Shoemaker, director of the School of Photographic Arts & Sciences, resigned as director to return to teaching. 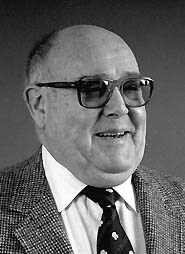 Professor David Engdahl, associate director, became acting director until the appointment of Dr. Russell Kraus as director in 1978. Professor David Engdahl remains as associate director and has also returned to teaching. The School of Photographic Arts and Sciences is physically constructed of building materials, photographic equipment and specialized facilities. It was originated as concepts in the minds of Fred Brehm and C.B. Neblette. It was nurtured by members of the Board of Trustees, the Administration and representatives of the photographic industry as well as by support of friends and alumni. However, it is due largely to the quality of teaching by the faculty working with a cooperative administration through the years that has brought the School to its present level of respect on an international scale. We feel that this is only the beginning. May the next 50 years be as productive and satisfying to all involved in advancing and maintaining our high educational quality. Appendix IV graphically shows the numbers of graduates from the school educated by this remarkable team effort. I wish to acknowledge the help and cooperation of Mrs. C.B. Neblette, who was the School secretary for many years, and to Ms. Gladys Taylor of the Institute's Archives Office, as well as Professors Emeriti Hollis Todd and Edwin Wilson and Professors David Engdahl and Leslie Stroebel. Their information and suggestions were most valuable. It is fortunate that Vice President Emeritus Leo Smith conducted a tape interview with Professor Emeritus C.B. Neblette a few years after Neblette's retirement. The tape proved of great help. In conclusion, may I present a personal note. When I was asked to write the history of the School of Photographic Arts and Sciences, I was quick to respond positively. The reasons were simple. I had the honor to know Fred Brehm and C.B. Neblette both as a student and on a deep level of friendship. It was not until I started to write the history, after acknowledging these men, that I found several problems at hand. This history was to be concise. But how does one be concise when one has been closely associated with some 60 outstanding educators in specialized fields of photographic education? Having served as Director of the School my mind is filled with pleasant anecdotes and pride in and for this fine group of men and women. After all, the School is largely the success of their efforts. I have included some names but I do not mean to minimize the importance of the others. Appendix I contains the names and dates of service of these deserving people. Without each member of the faculty and administration we could not be the outstanding school in our field. Fred Brehm was associated with the photographic industry since 1892. He was one of the first commercial photographers in Rochester and his work was recognized by being awarded many prizes in local and international exhibits. In later years his color transparencies -- most of them photographed in his own garden -- were widely exhibited. Fred Brehm was a fine photographer, and he was blessed with an imaginative and inventive mind. Perhaps one of his more far reaching inventions was the "Cirkut Camera" in which the camera and lens moved in a horizontal arc while the film was exposed as it moved past a narrow alit. This technique required a remarkable synchronous relationship between the camera and the film movement. It is interesting to note that the majority of aerial strip cameras operate on the principal of Brehm's It eirkut" camera. In 1910 Fred Brehm took his cameras to the British Isles and concentrated on the Highland Country of Sir Walter Scott's "Lady of the Lake." He pedaled his bicycle many miles over hilly roads and had to trudge other miles on foot to obtain remarkable photographs. While at Eastman Kodak Company, Brehm attempted to organize photographic technology courses at Cornell University and Oswego State Teachers College. It appeared that he was a prophet before his time as the courses were not well accepted. However, in 1930, Eastman Kodak Company deemed photographic education as an important facet on the Rochester scene. Accordingly, Fred Brehm was "loaned" to Mechanics Institute to be an instructor in the Institute's new photography program. He taught at the Rochester Athenaeum and Mechanics Institute until July, 1944, when he became a consultant and instructor emeritus, continuing to devote many hours to advisory and research work. Fred was a father image to many of his students. He was an understanding and positive influence in many of our lives. Those who studied under him affectionately called him "Pappy Brehm." He will be long remembered by those who were fortunate to have known him. He made an effective partner with C.B. Neblette in getting the School off to a successful start. C.B. Neblette began his professional career as an educator at Penn State University, teaching Photography from 1921 to 1923, in conjunction with the agricultural program. In 1925, he was named head of the Technical Photographic Laboratory at Texas A&M University. Here he taught Photography in Agricultural Illustration until 1930. In this same year, Mr. Neblette joined the Sales Service Department of the Eastman Kodak Company in Rochester. While he served this company until 1935, C.B. Neblette also devoted his educational service as an instructor at Rochester Athenaeum and Mechanics Institute (Rochester Institute of Technology as of 1946) from 1931 to 1935. C.B., as he was known to his friends, devoted 36 years of diversified and innovative service to RIT. Having been an instructor of photography at the Institute since 1931, he became head of the Department of Photographic Technology in 1936. Throughout this phase of his career as an educator, C.B. taught Photography, Sensitometry and Scientific Applications of Photography, and in 1958 he was designated Professor of Photography. In 1960, colleges within the Institute were established and "head of the Department of Photographic Technology" was translated into director of the School of Photographic Arts and Sciences. This same year Neblette became Dean of the College of Graphic Arts and Photography. Throughout his years of leadership, C.B. Neblette gave insightful directions to the School, making Rochester Institute of Technology the first institution of higher learning to place photography on the same level as other disciplines. C.B. Neblette is appropriately referred to as the "Father of Photographic Education" for his diversity in the field. His publications, courses, program preparations and concern for students' futures earned him this title. C.B. Neblette had an active relationship with many photographic organizations. He had been a member of the Royal Photographic Society of Great Britain since 1920. He was an active member of the Photographic Society of America and the Society of Photographic Scientists and Engineers. He was the recipient of many honors. He was an Honorary Fellow of the Royal Photographic Society of Great Britain, an Honorary Member of the Photographic Society of America and a Fellow of the same society. Mr. Neblette received an Honorary Master of Photography from the Professional Photographers of America and was made a Life Fellow of the Society of Photographic Scientists and Engineers. Those who worked with C.B. found him an inspired and challenging leader. He had the ability of helping each individual reach his or her full potential. Students knew his administrative capabilities, but they admired him most for his love of young people, and his quick smile, his grand sense of humor and his cigars! III. PHOTO DEGREE PROGRAMS OFFERED FOR THE FIRST TIME BY THE SCHOOL OF PHOTOGRAPHIC ARTS AND SCIENCES.